Crypto-related projects have a very distinctive common feature: they gain momentum super quickly! 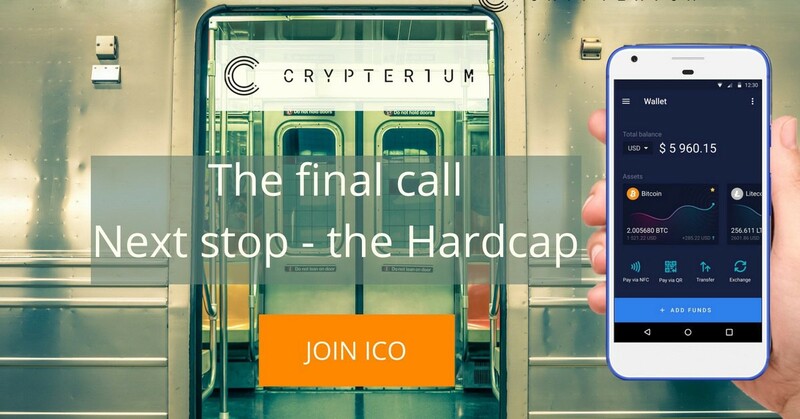 Crypterium, our cryptobank in the making, is a prime example of just that. The first four days of 2018 have shown high selling rates and a growing interest shown towards our project by token holders from all around the world. The past 5 days have witnessed 50 000 new registered accounts in our system, which now has over 300 000 accounts overall. Over 50 000 users have become CRPT token holders, while our Telegram community has grown to 28 000 members. This is delightful news to us — not only because it shows that the idea of a cryptobank is in high demand, but also because it guarantees that our product will have a huge active community of users, testers and supporters from the very beginning. Given the current token selling rates, we can predict that the hardcap will be reached VERY soon. We can’t foresee the exact moment but we are sure it will happen in the nearest future — perhaps even today. It means there’s just a tiny amount of time left for you to buy CRPT tokens, so hurry up! Don’t hesitate and wait too long. The token sale can end any minute now — seize your last chance to join our ICO! The hardcap is imminent, so we’d like to tell you about a few upcoming changes regarding the bookbuilding platform. They’re going to make the token-buying process faster so that you could squeeze in before the token sale ends. The platform will switch to auto-buying mode: you’ll no longer have to make a deposit and buy tokens as separate actions. Starting January 5, tokens will be automatically bought once you’ve made a deposit. This will speed up the token-buying process. You can find the full details on these changes in our blog.